One of the things I like about the free to play mobile market is that it reminds me of Newgrounds, the popular social media website where people upload indie flash games and movies. Though most often lacking in original material, the community often creates and shares creative variations of existing content to present their own unique take on it. Since almost any gameplay concept is fair game (and with the added notion of earning money), the free to play mobile market has followed the Newgrounds model for a time – to the point of cancer wherein there are a shameless number of repackages and reskins of particular game types with no real characteristic uniqueness in the hope of cashing in on the hype and milking whoever comes along to try the game. However, there are still titles and developers trying to make a hackneyed game idea their own – those, even with humble graphics and effects, try to bring back the days where just slightly tweaking already proven games can give you new and simple experiences. Brave Trials is one of those games. 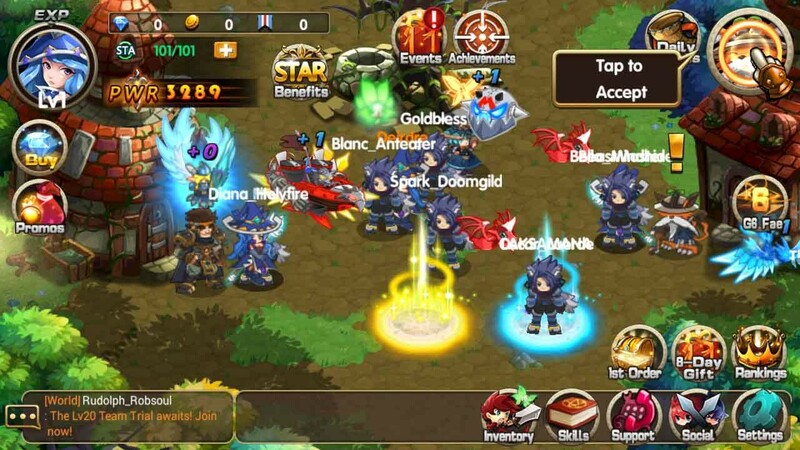 Brave Trials is a real time 2D action MMORPG developed by IGG. 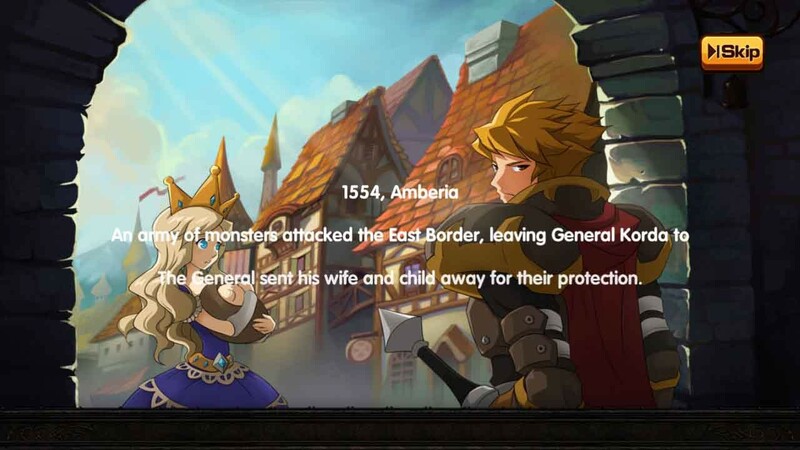 It’s a dungeon brawler beat em up type with RPG classes and a partner and pet system. 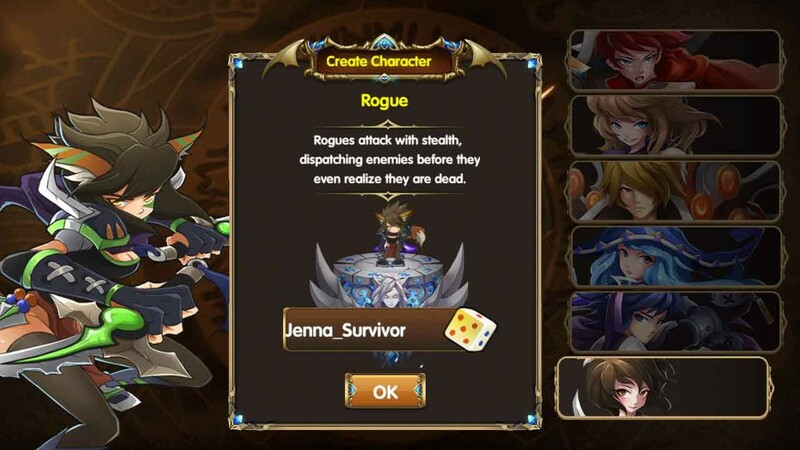 To start you off, the game lets you choose a character out of the three available job classes – a swordsman who specializes in close range combat and damage absorption, the rogue with considerably higher attack damage but lower resistance, and the mage that specializes in long range multi-hitting spells. Each job class comes in both genders with slight tweaks, making a total of 6 characters to choose from. The premise of the game is that the player has the unique ability of being able to use Faen, magical creatures that assist your characters in battle. You are then tasked to travel across the land, completing trials to save your kidnapped friend along with the rest of the village from the clutches of evil, killing hordes of monsters in the process. Obviously we’re not here for the plot. When you’re in town, the game plays like a typical browser-based MMORPG. The entire town is a lobby wherein you’ll see most other players’ avatars running around or in an idle state. The game follows the auto-pilot quest system, wherein you merely tap on the prompt and your character will automatically go wherever he or she needs to go. Though I’m not one for lazying it up for faster and simpler gameplay, it’s actually quite convenient as the chibi style of characters and the way the screen is mostly packed makes for harder manual navigation (which you can still do). As a result, I imagine most will be welcoming towards the auto-questing to get between points. Don’t take this as a compliment, as it’s clearly an interface issue, but at least an interface issue with a convenient work around. You don’t have to dwell on that much though as there really isn’t anything much to do in town anyway (another glaring drawback) besides prep yourself for battle through managing your inventory and Faen. 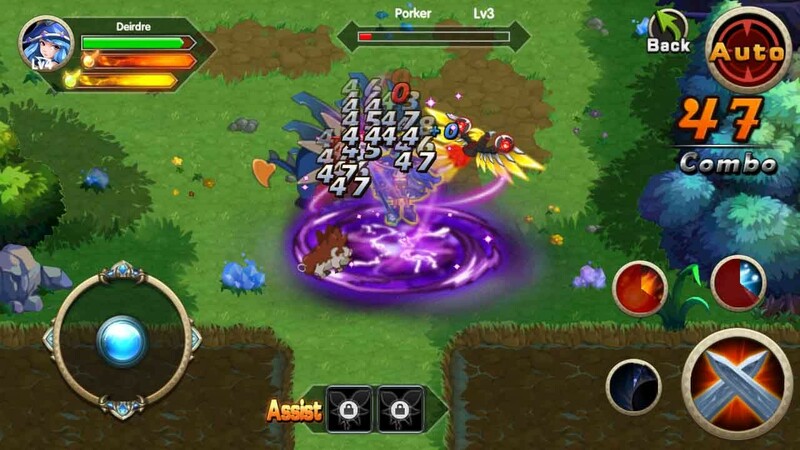 In battle, your controls are the same as in most mobile action games. D-pad on the left corner, one big attack button to the right. Repeatedly tapping the attack button unleashes your character’s default attack combo. You are also capable of performing any of your character’s 3 signature skills at any point in battle. These skills consume MP and have their own individual cooldown timers, so you can’t really spam and abuse them. Each stage is often cleared just by clearing the map of all enemies within a set period of time. As the game goes on, enemies spawn more, get tankier, and move faster. Trials becomes, in theory, a game of how efficiently you can use your skills and attack patterns to optimize your dungeon time. In practice though, having the best equipment and Faen means your skills can falter while still maintaining legendary clear times. Besides leveling up and getting better equipment along the way, your only real measure of growth is how strong your Faen is. You collect them in your journeys, until you reach capacity and start feeding weaker Faen to power up your core Faen. Faen are also available in varying rarities – higher stars obviously meaning more powerful pets. And since your character doesn’t really grow that much as your attack patterns and skills stay the same, the game is roughly making the players focus on collecting, growing, and maybe purchasing said pets. At first, it would seem that the Faen are just additional attack support, which is nice. Yet there comes a point wherein you have to depend on them for actual damage. 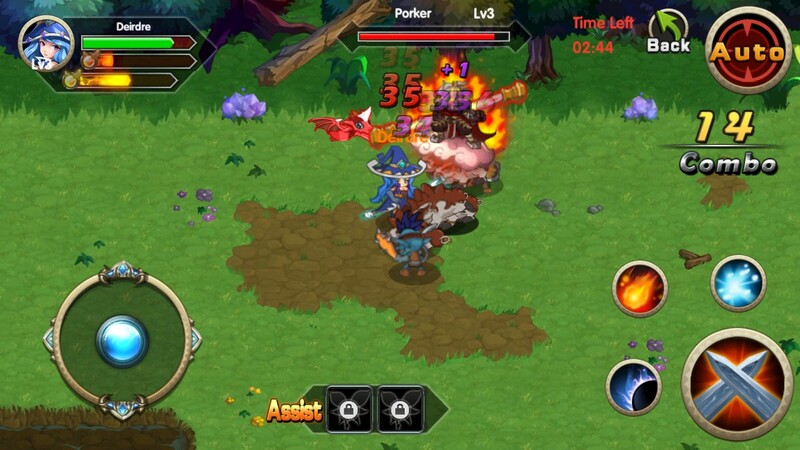 A Faen’s growth rate is a lot faster than the player’s since it only needs manual feeding as opposed to the character’s experience grinding. 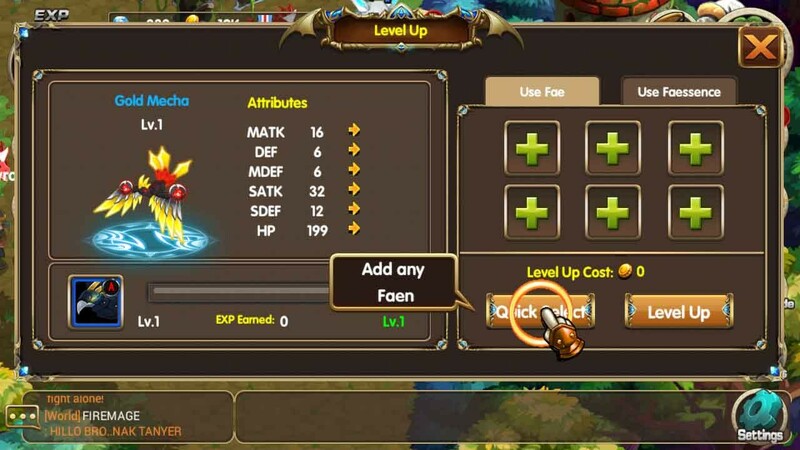 In the end, the Faen is your major focus limiting progression, since without it you won’t keep up with the challenge expected of you for unique events or level-appropriate gaming. As for the look, Brave Trials looks like an art project thrown in together by some college students to pass as a thesis – you know they tried, but along the way, it just fell through and was just rushed in the end to make the deadline. That, or it looks like a DeviantArt collab. It’s simple and cutesy, but very inconsistent, and I guess what mattered to them was simply getting the game up and running. Polish update set as a TBD. But despite all the flaws and lacking polish of the game, Brave Trials tries to be its own brand with a simple yet unique take on the hackneyed format. As I’ve said, it’s very reminiscent of Newgrounds’ peak days of simple but ingenuous creative discovery. 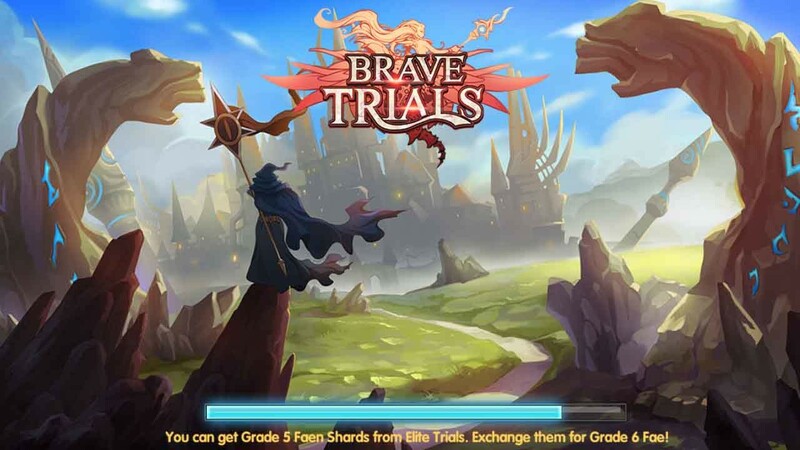 So even if Brave Trials won’t be winning any gaming awards anytime soon, the game is still worth a download and some time for those simply looking for some simple action RPG fun.